Computex 2013. Como estaba previsto, Intel ha anunciado el lanzamiento oficial en la feria de Taiwán de la nueva plataforma de procesamiento Haswell, nombre en código de la cuarta generación de microprocesadores ‘Core’. Haswell incluirá versiones para tabletas electrónicas, ordenadores portátiles, equipos de sobremesa, Ultrabooks y hasta servidores, a través de múltiple variantes comercializadas bajo las conocidas denominaciones Core i3, Core i5 y Core i7. Los chips Haswell están fabricados en procesos tecnológicos de 22 nanómetros y como sus predecesores, los Ivy Bridge, incluyen la CPU, GPU y controladora integrada en la misma die. Ya te mostramos el rendimiento (aumento general del 15%) de la CPU a través del análisis del Core i7-4770K, el nuevo tope de gama de los Haswell para escritorio y que contemplan al menos una docena de unidades con 4 núcleos y la mitad de ellos con ocho hilos de procesamiento nativo. También destacable el nuevo procesador gráfico integrado HD 5000 ‘Iris’, que aunque no podrá competir en rendimiento con dedicadas de AMD o NVIDIA, prometen una importante subida de potencia (50 por ciento), mejora de características y aumento de soporte frente a los Ivy Bridge. Estos Intel 5000 se dividirán en tres variantes según potencia y consumo: HD 5000 estándar para Haswell de 15 vatios, Iris HD 5100 para los de 28 vatios e Iris HD 5200 para los procesadores más potentes a partir de los 47 vatios. Además del aumento de rendimiento de procesamiento y gráfico, de las nuevas instrucciones AVX 2.0, del soporte para memorias DDR4, de la mejora de la capacidad de overclocking, de la memoria caché L4 exclusiva o del soporte para librerías multimedia Direct X 11.1, Intel también destaca el bajo consumo de los Haswell. La alta integración junto a “estados de baja potencia” posibilitará uno de los puntos fuertes de Haswell, ya que permitirá reducir su consumo y con ello mejorar la autonomía, un aspecto clave enUltrabooks, uno de los segmentos estrella a los que van dirigidos estos Haswell, sin olvidar la versión vPro que ofrecerá seguridad y gestión nativa por hardware para equipos corporativos y profesionales. Unos Haswell que se venderán en el canal minorista y también a través de una gran cantidad de fabricantes de equipos originales OEM que están presentando sus productos en el Computex. 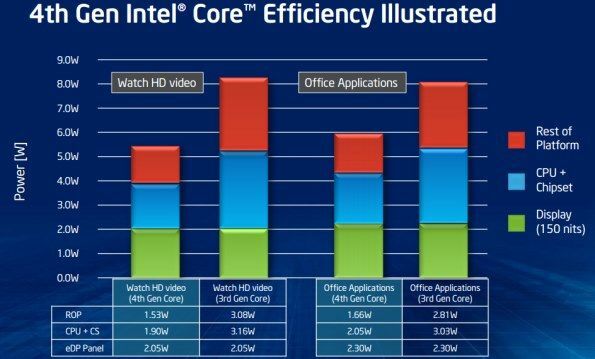 Tendremos tiempo para hablar largo y tendido de estos Haswell por su importancia ante elrelanzamiento del sector PC, por las ‘nuevas experiencias móviles que ofrece’ o por el ‘concepto de equipo dos en uno (portátil-tablet)’ que según el gigante del chip va a impulsar. Te dejamos con la nota de prensa oficial. SANTA CLARA, Calif., June 4, 2013 – Intel Corporation today introduced the 4th generation Intel® Core™ processor family, reinventing personal computing as people know it today. 4th generation Intel Core delivers optimized experiences personalized for end-users’ specific needs, packing extraordinary battery life capability, breakthrough graphics and new usages in devices such as 2-in-1s, tablets, robust enthusiast and portable all-in-one systems and secure and manageable business device with Intel® vPro™. The new Intel Core processors provide incredibly responsive, secure and powerful performance for consumers to create and consume content wherever their mobile lifestyles take them. The first chip ever built from the ground up for the Ultrabook™ and the most significant roadmap change since Intel® Centrino® technology, 4th generation Intel Core processors combine stunning PC performance with tablet-like mobility, accelerating a broad new category of 2-in-1 devices. With power levels as low as 6 watts in scenario design power, Intel is enabling thinner, lighter, cooler, quieter and fanless designs. New Intel Core processors also power designs such as all-in-one PCs with great battery life, bringing portability to the growing category. 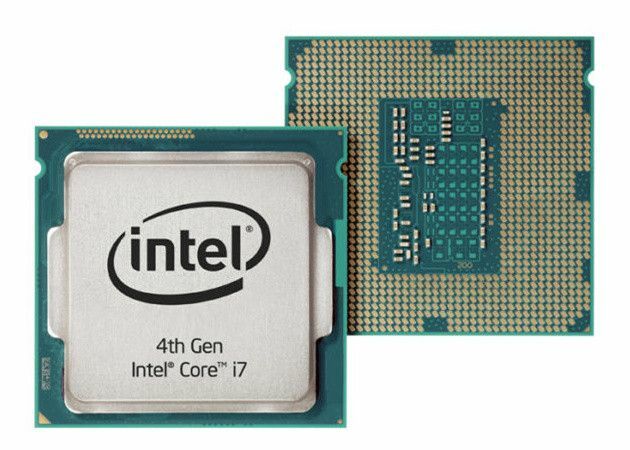 The highest-performing processor family, 4th generation Intel Core processors are capable of delivering up to 15 percent better performance than the previous generation. 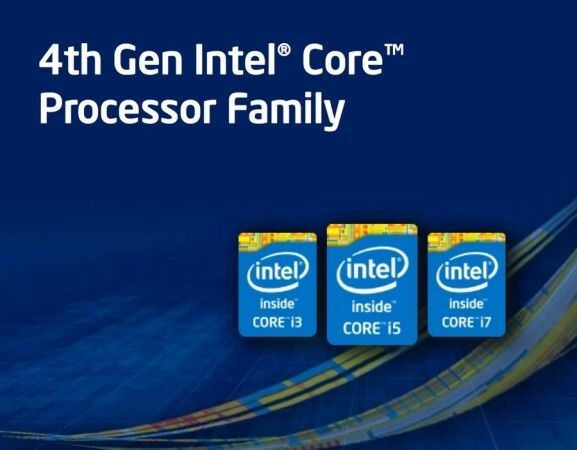 Consumer and business systems based on quad-core versions of 4th generation Intel Core processors are now available. 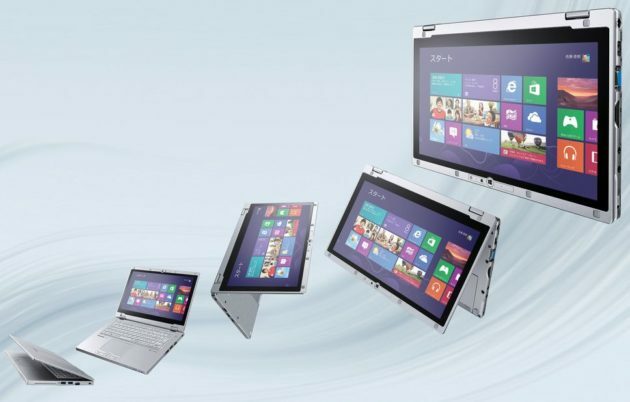 Summer availability is planned for 2-in-1s Ultrabooks, portable all-in-ones and traditional laptops and desktops. New mobile business products with 4th generation Intel® Core™ vPro™ will be available later this year. 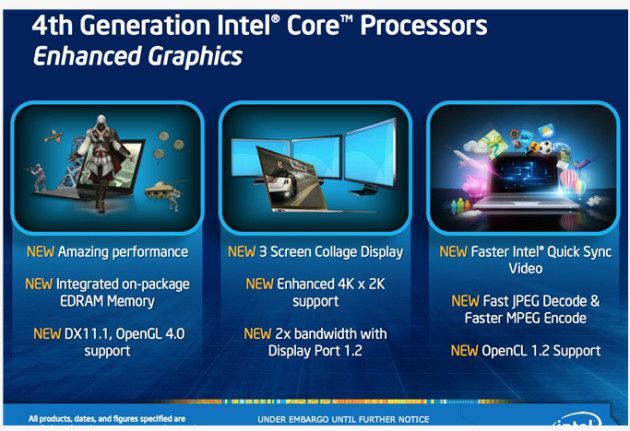 Pricing for the new Intel Core processors can be found on www.intc.com. Delivering Intel’s largest generation-over-generation gain in battery life enablement in company history, 4th generation Intel Core processors can bring an 50 percent improvement in battery life over the previous generation in active workloads when watching movies or surfing the Internet, and two to three times improvement in standby battery life. For some systems coming to market this year, over 9 hours of active use battery life or 10 to 13 days of standby with fresh data on a single charge is expected. To achieve this breakthrough, Intel exceeded its expectations on power reduction at the CPU level to as low as 6 watts and also worked across the system for power optimization. These improvements range from System-on-a-Chip (SoC) and platform level technologies to Intel’s leading-edge 22nm process technology. Active power is improved as is idle power by architecting new ultra low-power processor states where the CPU consumes a fraction of the power compared to previous idle states. The 4th generation Intel Core processors also bring the highest performance currently available in mainstream computing with the additional benefit of superior graphics support. People will be able to experience every day computing approximately two times faster; systems can wake up approximately eight times faster and users will have the ability to edit and share HD video about 20 times faster; than a similar 4-year-old computer. Intel expanded its range of Intel graphics in the highly integrated SoC to deliver even more stunning visuals in thinner and lighter devices. Intel® Iris™ graphics, available on select SKUs of the 4th generation Intel® Core™ processor family, delivers up to double the 3-D performance over today’s fastest mobile Intel HD Graphics solutions. Intel Iris graphics bring next-generation mobile computing devices to life with a built-in, visual experience – no extra graphics card required. The 4th generation Intel Core processor also enables a number of new computing interactions to enhance the overall user experience. 4th generation Intel Core – completely redesigned from the ground up specifically for the Ultrabook – represents a seismic shift in the compute landscape. New Intel Core raises the bar for Ultrabooks and realizes the vision Intel outlined 2 years ago to combine best-in-class performance, impressive responsiveness and battery life and built-in security in thin and elegant mobile designs. All new Ultrabooks will be touch-enabled and have Intel Wireless Display capability built in to bring natural touch and motion interactivity and speed mode for low-latency gaming on the big screen. Ultrabooks will also be hardware-ready for voice command and control, giving the user flexibility to choose the most natural and intuitive way of handling the task at hand. Ultrabooks will wake in less than 3 seconds from deep sleep and in some cases much faster, offering the nearly “instant-on” experience that people want. Ultrabooks will pull email, social media and other updates while in a low-power mode, meaning less waiting for fresh data upon waking. Ultrabooks are also equipped with built in security capabilities including Intel Identity Protection Technology (Intel IPT) and Intel Anti-Theft Technology (Intel AT) for more computing protection. Websites partnered with Intel IPT help protect log-in information, keeping identities safe based on hardware authentication. Intel Anti-Theft Technology helps protect Ultrabooks by automatically disabling it if lost or stolen. The recently introduced McAfee LiveSafe service brings the deepest protections available by taking advantage of technology in new Intel Core processors and Intel IPT and Intel AT. To ensure the best business computing experience for both IT staff and end users, embedded features in 4th generation Intel Core vPro processors further strengthen security and increase business productivity. Available today in select business desktops, all-in-one PCs, ultra-small form factor and mobile workstation devices with future availability later this year for Ultrabook, tablet and business laptop devices, Intel Core vPro offers superior performance for secure, productive and collaborative experiences allowing end users and IT to compute with confidence.